The Dallas Theater Center committee approached Frank Lloyd Wright to design a theater on land donated by Sylvan T. Baer along the picturesque Turtle Creek. Wright, busy at the time with other projects, suggested that if the committee could use a plan already in his files he would agree to the project. The original design had been created for a West Coast theater in 1915 and later adapted for Hartford, Connecticut. Neither of these theaters were built, for various reasons, and the design was adapted for Dallas. Construction began in 1955 and was completed four years later and nine months after Wright’s death, at a cost of more than $1,000,000. The Kalita Humphreys Theater opened on December 27, 1959, with the first play being Of Time and the River by Thomas Wolfe. The theater took its name from an actress who worked with Paul Baker, the first director of the Dallas Theater Center. Kalita Humphreys died in a plane crash in 1954 and her parents donated $120,000 to the theater as a memorial. The theater was recognized as a historic City of Dallas landmark in 2007. 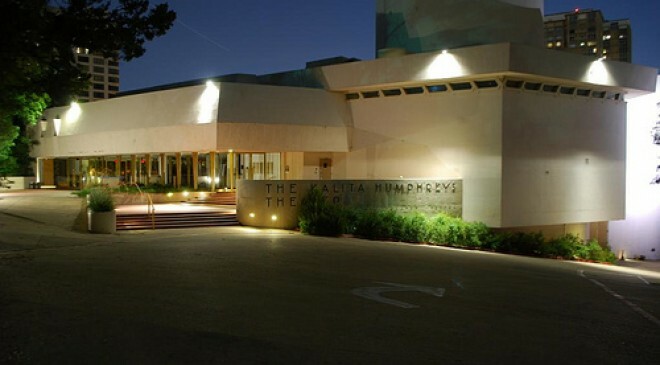 The Kalita Humphreys Theater is located at 3636 Turtle Creek Blvd.